Act 1: Hungerford 1903. Outside the Town Hall, William Rosier is about to have his goods and chattels sold. He has refused to pay his rates. He is the first of many good citizens in Berkshire, and across England and Wales, to end up in court. 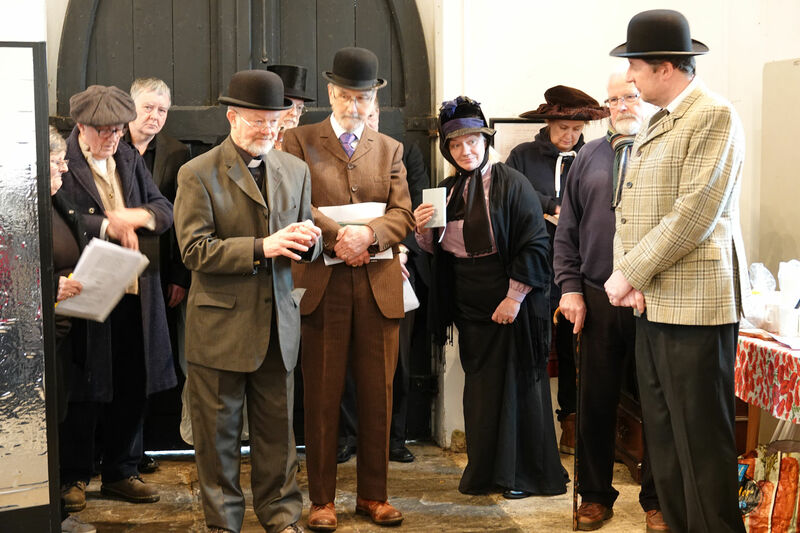 Following the auction, William Stanley Knight on the gavel, local ministers led a prayer/political meeting exhorting citizens not to pay their rates. Act 2: Magistrates Joseph Napoleon Day, John Rankin and Joseph Elliott hear the case of 35 local residents who refuse to pay their rates. Speakers include Charles Midwinter, Samuel Seward and Rose Dolton. 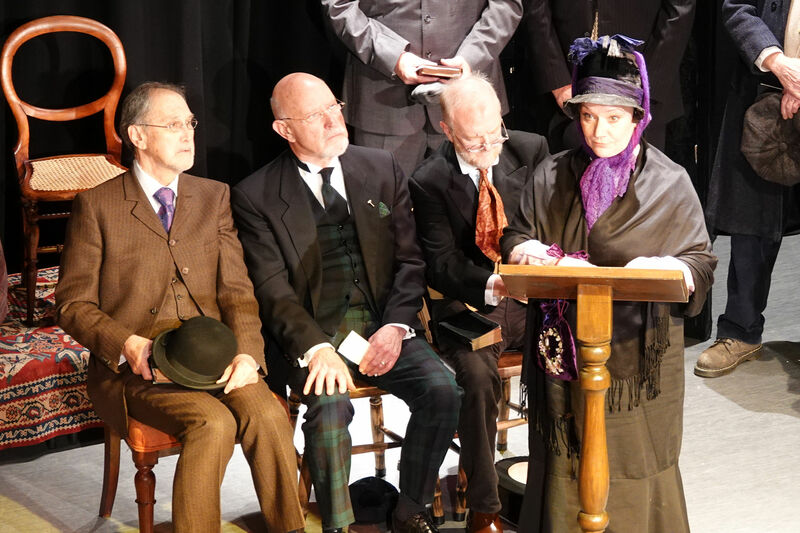 Edward Harper Titchmarsh makes his feelings known again and later in the Lecture Hall (of the Congregational Church on Northbrook Street) closes the play with warnings about how this protest might have national and even international repercussions. Below are links to the script or scripts used in the play. They can be downloaded or viewed on the web site. Eva walks to face the audience: At the turn of the 19th century industrial output and educational standards in Britain were falling behind Europe and the United States. The Conservative and Unionist coalition Government, which had been in power since 1886 , sent the Director of the Office of Special Inquiries and Reports abroad to find out what other countries were doing. While he was travelling Robert L. Morant deputised for him. The1902 Education Act was designed to improve standards in primary and secondary education by amongst other things, levying a local tax to be distributed to all local schools. Voluntary schools, usually Anglican or Roman Catholic, were in need of better funding. Non- conformists who ran Board schools, already funded by local taxes, did not want to support these Church schools in any way. On September 24th 1903 the first person to refuse to pay is to have his personal goods auctioned to pay the overseer what is due. Superintendent Robotham! How pleased I am to see you. One of my parishioners told me that I should see an auction here. This morning. Is that the case? Indeed Rector. But you are a little early, it is scheduled for a quarter to 12. Looks up at Town hall clock? Do you think there will be trouble, Superintendent? I hope not, sir, that is why I am here, to keep the peace. I am not sure I understand what is going on. What is being auctioned here? I am not too sure but I do know the items belong to Mr Wilfred John Rosier and he has been in court twice this month. So he’s having to sell his belongings to pay a fine? But what has he done to incur this penalty? Ah, that’s easy to explain – he refused to pay his rates! Well at least he refused to pay part of his rates. In truth the overseer had proved an incorrect amount as Mr Rosier had moved into Park Street 2 days after the date the amount was calculated from. On the magistrates instruction the rate was calculated again, but it was already obvious that he would not pay the second time he appeared. How much is he required to pay? Is he suffering pecuniary embarrassment? I think not sir, he is an Insurance Agent. He says his refusal is a matter of conscience. Does he not want to provide for the poor? O, he is quite prepared to pay the poor rate but he will not pay the education rate, the new portion since last year’s Education Act of Parliament. And he must pay it all. My understanding is that this new Act is for the benefit of all our children. Mr Morant sent colleagues to many countries in Europe: Holland, Switzerland, to look at the ideas of education reformers Pestolazzi and von Fellenberg, so that we can improve our education system at every level. Why does Mr err Rosier you say? (SOR nods) Why does he object to improving education for Heavens sake – o I do beg your pardon! Has he had any education? I am not sure, o yes someone told me he attended the Boys Board School in Ramsbury. It was there he started to play his instruments (indicates them) to accompany the school singing. I think Mr Rosier would agree with you. (Turns around) Ah there he is. (nods towards WJR) What he is not happy about is the use of his rates to support Voluntary schools. You mean like the denominational schools, like the Church school in Newtown where I am governor. But what on earth does our local baker want with a cruet? Seward picks up piccolo, WSK starts bidding at 3d. Shall we start this piccolo at thrupence? First bid from Smith. Harris keeps hand up. Bidding ends at 3s6d. Seward picks up clarinet, WSK starts at one shilling, Midwinter first bidder, sells 2s6d, Harris again. Siney makes first bid. Bidding – sells for 25s. Harris buys again. It seems I have sufficient. I will detain you no longer. Quite enough has been sold to cover the rate and the expenses of the court and the auction. Thank you everyone. I am sure we are much obliged to you Mr Knight for being so courteous. And thank you officers for your presence. Harris walks over to Rosier Rosier puts some items in carpet bag and takes purse back from Harris. Harris helps Rosier to remove fender and rug. They return shortly. HBG begins to set up his protest meeting, putting up posters of Rev John Clifford and moving the deed boxes to stage right. And that is the end of it? I fear this is just the beginning. I hear that scores of dissenters will appear in court soon, in Newbury, Reading, indeed all over England and especially Wales. And they will all refuse to pay the education rate. And then the court will make a distraint order and send in the bailiffs. There will be many more auctions all over the land. If you stand to the side I think you may hear more about these matters of conscience. Ah Reverend Grantham, have you come to support our cause? Reverend Titchmarsh, perhaps you can tell me who the gentleman is on the Daily News sheets? That Sir is the Reverend doctor John Clifford of Westbourne Park Chapel. He is leading our cause across the country. And he is especially valued in this area as his wife, Rebecca, is the daughter of the late Dr Thomas Carter of Bartholomew Street Newbury! I see. Does your cause have a name? Indeed we are ‘Passive Resisters’. Now I must address the meeting. Excuse me, you are of course welcome to stay. Now your Reverend Goodwin of the Primitive Methodist Church (points to his left) here in Hungerford will address you with a message from Congregational Pastor Summers. We are not here as law breakers, but as men who recognised that no Parliament has a right to override by its own decision the laws of God – which we hold to be dearer than the laws of men. I have here a letter from the Rev W H Summers, Congregational Pastor here in Hungerford. I shall read his words to you. I am sorry that owing to the engagement at Oxford of which I spoke to you the other day, I am prevented from being with you tomorrow and expressing my intense and growing opposition to the policy of the Education Act. The more I see of its practical working and the unfairness shown in many quarters, and by the Berkshire County Council especially, the more glad I am that Nonconformists did not yield to the plausible appeals to ‘give the Act a fair trial’. Out of the 31 members of the Berkshire Educational Authority only one is a nonconformist and as this gentleman happens to be laid aside by a severe accident, we are left without a single representative at this most critical juncture. I think that our county scheme is one of the most one-sided in England. I am disgusted by the cuckoo-cry that this is ‘only a political agitation’. The same charge was brought against the early Christians, and it is the stalest plea of the persecutor in every age. If we have little to complain of in Hungerford at the present time it must be borne in mind that the rate is not for this parish alone, but for country parishes in which there is but one school and therefore no choice for parents. Besides at any time a change of clergy may bring into Hungerford itself a less broad and liberal spirit than at present prevails. It is 15 years since I ever spoke at a political meeting, and 7 or 8 years since I attended one. So I don’t think anyone can call me a political Dissenter. But I am thankful to see that many Nonconformists who have been Unionists (all Protestants of course) are putting their religion before their politics and opposing the Act. What we need is to do away with indirect elections and co-optations and secure direct public control so that all denominations may have equal rights’. Now Rev Titchmarsh from Newbury Congregational Church would like to offer his thoughts on this matter. I am one of a great army who are determined that no single Nonconformist, who felt called upon by his conscientious conviction to take up this position, should be left to stand alone. Mr Rosier and everybody else (points to Rosier)will be made to understand there is with him the ardent and active support of a great mass of his fellow Nonconformists. Dr Clifford (points to poster – cheers) has written to me that he is glad to hear there are so many Passive Resisters in Newbury, and he has no doubt that the principle will grow in the royal county, as it is growing all over the country. We have 40,000 Passive Resisters now. This is a remarkable fact, the more so because of the spontaneity of the movement. Our fellow townsman, Mr Rosier, has not taken up this attitude because anyone has persuaded him, but because of the steady and deliberate growth of his own conviction of what is right and what is required of him. In Newbury some of us met in January last to form a Citizen’s League, then our members numbered only 3 or 4, now over 40 persons have refused to pay the Education Rate. I have not persuaded anyone to join this movement but have just pointed out my own position in this matter. A friend has made the doleful prediction of the way in which the Conservative Press will ridicule us. Only the other day he noticed in the “Daily Mail” an account written by a correspondent who had been on a walking tour through East Anglia. He said he had interviewed some 800 people during the course of his tour, and the only question they were keenly interested in and thoroughly understood was the question of Passive Resistance, and he pointed out that the Government had no idea of the really serious danger this was from their point of view. In this cause of Passive Resistance we stand first of all upon our own conscientious convictions about religious teaching. We decline to pay for teaching the catechism which is repugnant to our conscience. If there is to be religious teaching at the public cost – and some of us are very doubtful about that – let it be upon those points upon which we are all supposed to agree, and not upon dogmas and doctrines upon which we differ, such as Baptismal Regeneration. We know that learning the Catechism by rote can never be enough to be accepted into the Kingdom of Heaven. Faith is the indispensable requisite to salvation! Whilst Nonconformists are taking a stand for our own convictions we are also upholding the rights of the people. We are fighting for the clear right of the teacher to be chosen for his qualifications as a teacher, and not because he belongs to a particular church or because of his power to play a particular church organ. We are not standing only for our own religious convictions we are also standing for the rights of teachers, for the efficiency of public education, and for the rights of the people against a spurious majority in Parliament. There has never in my time been so grave an abuse of Parliament as the passing last year of the Education Act. I am exceedingly glad that things have gone off amicably this morning, and I think the authorities will find things will pass off amicably, so long as they are reasonable and polite as they were this morning. We are not going to pay this rate so long as this Act remains as at present. We will go on until some Government or other (pause) recognises the injustices of this Act and removes them from the Statute Book. I think I am more confused than ever! This Citizen’s League, which I had never heard of before, is refusing to pay the education rate, not for the sake of their own children and grandchildren, or indeed children of their parishioners. In Hungerford and of course Newbury there is a choice of school, Board or Voluntary, but it is true that in Hungerford Newtown, where I am a Governor, all children have to attend the St Mary’s Church of England School – where the catechism is taught. But children can always be withdrawn from religious teaching and worship – difficult at times, though I believe the new Act stipulates such teaching to be at the end of the day – or first thing in the morning. Am I right in observing that Mr Rosier’s friend, Harris the baker if I am not mistaken, was using Mr Rosier’s own purse to pay for the items he won at auction? I couldn’t possibly comment sir! Three Magistrates walk from rear right to centre stage together, JND holding papers. Thirty six summonses for today. We shall be here until this evening! Tis true. Midwinter and Nash mentioned this state of affairs Sunday last. They are worried it will be bedlam - as Best’s county petty session was two weeks ago. Then there were only about 10 ratepayers on that occasion but the police had to step in and they ejected poor William Froome. Did you read the account of the lecture on Passive Resistance in yesterday’s paper? Thompson read out his letter to the Chief Constable about the way Froome had been treated and he, Major Poulton replied – that was read out too. It seems I’ve missed some excitement here. I haven’t had time to read the Newbury yet. These upstanding citizens are up before us because they refuse to pay the rate, that’s right, isn’t it? Partly. They are more than happy to pay the Poor Rate, as they did last year and every year past but not the new Education Rate. And of course they have to pay it all –that’s the Law. So what happened in Marmaduke Best’s session then? I wish I had been there! There were only – only- about 10 of them, not 35 - and it didn’t begin too badly. That’s not true –the first defendant queried that a magistrate who is also on the Board of Guardians and responsible for Poor Relief, like you Elliott, shouldn’t adjudicate. Oh Lord! Will that happen again? Each one got up in the dock and stated why they wouldn’t pay “I am not guilty, I would be guilty if I did pay”. And then Froome’s rant had him a round of applause and Supt Robotham shouted “Silence in Court” and threatened to throw out any man that made a noise! My word! Better and better! Is that all? When was Froome ejected? Not yet because next to take the stand was Mrs Allee of Newbury, apparently she has property in Chievely – except she wouldn’t! She didn’t pay. It might have been now that two constables carried Froome out of the court room! Why? Why? What had the poor old soul done? Well that’s the rub! Because all the Resisters said he just sat at the back quietly – you know how deaf he is? But someone did applaud and Robotham and Best thought it was him. He was very upset and Arthur Brown – you know the Thatcham Overseer – he did speak up for Froome. Said they were rather hard on him. Ha! Did his feet touch the ground? I suppose Brown was there to prove the rate? No that was the point, the assistant overseers proved the rate all through because Brown had also refused to pay his rates!!!! Though after he had made his protest he did pay plus the costs, of course. We can’t have that sort of thing today. Will Robotham be here too? Are there any ladies who have refused to pay (looking at papers) Oh Lord! Mrs Chivers – and both Dolton sisters! (Checks his papers and nods) How much time have we before proceedings start? We have 35 cases of Passive Resistance to hear and our colleague St Gerrans has a case of a totally different nature. Eg have you had chance to speak to St Gerrans? Where will the ladies say their piece? Singing can be heard from outside. O that with yonder sacred throng………. A crowd of ladies and gentlemen enter looking confused, not sure where to go. I believe they have held a prayer meeting at the Primitive Methodist Church on Bartholomew Street. We have quite a crowd in court today. Ladies can I suggest that you all find a seat where the jury usually sit when needed, over here. Some of you gentlemen will have to remain standing I am afraid, but do use the chairs that are available. Mr Midwinter, Mr Bell, Mr Smith you should be comfortable here. Right. (Speaking to stage left) Mr Gerrans we have decided that we will take the non-payment of rates cases first. Although we are taking these summonses together you will probably wish to make some remarks and within reasonable limits the Bench are quite prepared to give you a hearing. I need scarcely remind you that this Court is not a place for applause, or demonstration of any sort, and we feel sure that you will respect the wishes of the magistrates that these proceedings should be of a perfectly orderly nature. I need only to say for myself, as well as for my colleagues, that it is exceedingly painful to have to adjudicate in a matter of this sort, in which so many respectable inhabitants of the town are concerned. At the same time it is our duty to adjudicate; we are not responsible for the law, but we have to see it is carried out. Perhaps you will allow me to say – although I have no authority to speak for the whole of those summoned, because many of them are not connected with any organisation – that if the taking of the cases en bloc means that the overseer will be sworn once for all there will be no objection raised. I may also say that the bulk will be content if their objections were briefly stated by two or three, and although I cannot speak for everybody I am sure the desires of the Bench will be respected. We have no desire to do anything in derogation of your position and authority. We only suggest this course: anyone who wishes can be heard separately. It is only necessary to state for myself and a good many others associated with me that in refusing to pay this rate we are by no means objecting to paying for education. I would be glad to pay for more than that for which I have been summonsed, for an efficient and just system of education. I object to paying this rate because it is associated with a system which I believe to not only be perfectly unjust, but also to be an invasion of my deepest religious convictions. This money is devoted in some schools to the teaching of a Catechism, which embodies doctrines which I regard – I would not like to disparage other people’s convictions (looking toward SOR and Bench) or to use the language of the Prayer book, which describes certain evil doctrines as “blasphemous deceits” or something like that but the doctrines taught by the Church Catechism I regard as perfectly untrue, and my whole life and ministry are based upon convictions which are opposed to all this. I cannot therefore without violation of my very soul pay this without compulsion. It is a matter of great injustice that in any school to which public money has been contributed Nonconformist teachers should be shut out by Religious tests. Religious tests which have wrought evil to religion, to the soul, and to the conscience. I am almost certain that the Act makes no such suggestion? I am only speaking for myself, and not necessarily for others, but I believe that there is a constitutional aspect of this matter, against which good citizens should be protected. Denominational Schools will not be appointing a Nonconformist teacher, however excellent their teaching skills may be, to the headship or even the staff of any National school that I know of. The Education Act of 1902 is so much against the spirit of the constitution of the country that the liberty of the citizen will be ultimately at stake. I have no more to say, except to thank you for your courtesy and consideration. Mr Turner you have something to say? Thank you, sir. As a citizen I protest that the Education Rate is the old Church rate resurrected in another form and as such re-imposes a system of sectarian tests for state-paid offices. On conscientious grounds I refuse to pay – painful as such a refusal is. The statements already submitted make the position of myself and my sister very clear. We feel very strongly that this introduction of religious tests is shutting the door of a very honourable position, in the face of some of our fellow Christians, which we would not willingly see happen. As a woman I object very strongly, recollecting the large share of the work of the Board Schools that has been done by women, and the honourable and splendid manner in which they have done it. Mr Bell, you wish to address us? I cannot pay this rate because I am a Protestant, and therefore wish to be loyal to the constitution of the country. The Education Act makes it possible for the rankest Catholicism to be taught in the day schools of this country and at the expense of the ratepayers! I must protest and I refuse to pay the rate. When the Nonconformist case was fairly put before the Prime Minister Mr Balfour by Dr Fairbairn, Mr Balfour said we were acting from a feeling of sectarian prejudice and bigotry, but as a Bishop of the Church of England has described the Act in the House of Lords a “game of grab” I have been led to the firm decision not to pay. You have our respect gentlemen, but if the Prime Minister, Mr Balfour were here in your place we would be able to tell him what we think of his policy. It is not long since Nonconformists prayed that the life of our King may be spared, but today we are being persecuted. I do not think, gentlemen and superintendent, there will be any trouble when you come to seize our goods. Thank you for your reassurance. Mr Smith? There are a number of reasons for not paying the educational part of the rate. The citizen’s right of direct popular control is being denied us by this Act of Parliament. I am summonsed to pay for teaching which as a Free Churchman I cannot accept and indeed would not allow my own children to receive. Mr Seward, you have something to add? I am extremely sorry to be a cause of trouble to the Bench. But it is my misfortune not my fault. I am here to refuse to pay for my children to learn what I detest. We are going back to the Reformation and I am prepared to stand by Latimer and Ridley rather than allow my children to be taught these doctrines. Mr Midwinter, you have something to add? My name is Charles Midwinter, a NEWBURY business man of some repute, a man of God, a non- conformist. I do not mind paying my taxes, I do not mind paying the poor rate. But, I do mind very much paying this EDUCATION rate in order that our children be scripted and taught that the rote learning of a few questions and answers is sufficient for them to enter the kingdom of heaven. Their faith and the way they live their life is the only route to heaven. I shall pay what I owe today with a heavy heart , I've said my piece, I've said my piece. We cannot but repeat our thanks for your courtesy, and the whole tone in which you have received us this morning. Everyone gathered that evening to sing hymns and hear from the Reverend McClure Uffin. His speech is just finishing. Rev McClure Uffin, thank you for travelling from Dorchester to address us this evening. We hear with interest your experiences of appointing a headmaster and realising that although Free Churchmen were not eligible the salary for the appointment would now come out of the public rate. As you tell us this Act is but an initial step in the game, and unless we resist it will not be long before this country will lose its freedom, and our necks will be placed under the foot of a priest. We will not allow this Act to extinguish Nonconformity. Indeed. Our resistance will afford the opportunity of educating our young people in the principles of Nonconformity and will be the means of strengthening our churches. It is quite possible that incidentally the result would be to do something to deliver the country from a great danger in another direction. Mr Chamberlain has said that the passive resistance of Nonconformity might beat him, and if so we will be rendering a service to the Empire, little dreamt of when this movement began. The Tories are losing their support as they propose to move away from Free Trade. Conservative MPs are changing to fight the next election as Liberals, that Churchill chap is one of them. We now have at last a local Liberal candidate, Mr Mackarness, who is not a Free Churchman but who is profoundly in sympathy with our position about the Education system. He will receive the support of all Free Churchmen. The Unionists continued to support the Resisters’ cause so that the 1906 general election was a landslide victory for the Liberals. In this area Mr Mackarness took the seat from Sir William Mount. The Liberals remained in power until after the Great War. However all their attempts to repeal the 1902 Education Act were blocked by the Bishops in the House of Lords. The Local Education Authorities created in 1902 are still with us today.